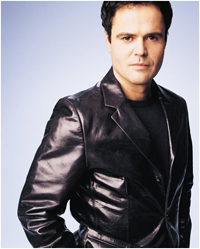 Today we are talking to an iconic performer known for his decades on stages and screens around the world, from his variety show roots with sister Marie and their eponymous 70s television staple to his solo pop career in the 1980s and roles in Broadway and Hollywood and beyond since then - the one and only Donny Osmond. 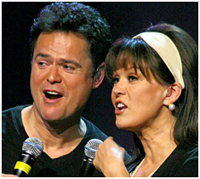 Osmond and I recount many of his marvelous show business memories in this all-inclusive chat, putting a particular emphasis on his theatre roles - most of all, his work in the film version of Andrew Lloyd Webber’s JOSEPH & THE AMAZING TECHNICOLOR DREAMCOAT, filmed in 1999 and presented next week in a super-special Sing-A-Long showing with an exclusive live Q&A hosted by Osmond in Fathom-equipped movie theaters nationwide on March 26 & April 4. 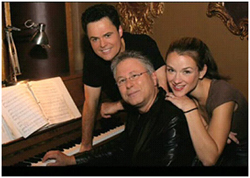 In addition to all about the filming of the spectacular movie musical version of JOSEPH helmed by Steven Pimlott and co-starring Maria Friedman, Osmond and I discuss his experiences playing the title role in the show for six years throughout the 1990s and how he looks back on his experiences in the Biblically-themed pop/rock operetta. 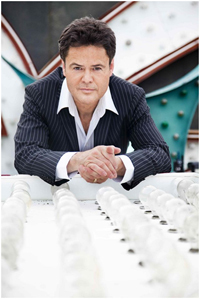 Plus, Osmond shares insights into the work of Andrew Lloyd Webber, as well as shares stories of working with legends such as Gene Kelly, Richard Attenborough, Joan Collins and touches upon his appearances in MULAN onscreen, BEAUTY & THE BEAST onstage, DANCING WITH THE STARS on TV - and much, much more! 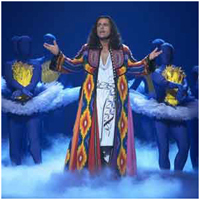 JOSEPH & THE AMAZING TECHNICOLOR DREAMCOAT will be presented in Fathom-equipped movie theaters nationwide on March 26 & April 4. 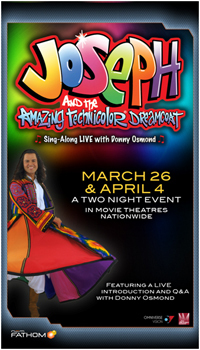 "NCM Fathom Events has postponed the Joseph and the Amazing Technicolor Dreamcoat events on Monday, March 26 and Wednesday, April 4. 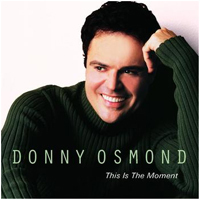 Donny Osmond has been placed on vocal rest by his doctors and is unable to perform for the planned live event. Fathom Events will evaluate when to reschedule the event once Donny has recovered. Ticket holders who purchased through Fandango or MovieTickets.com, may contact their customer service department for information about refunds. Ticket holders who purchased at a local movie theater box office, may contact the box office directly for refund information. For other information and updates, please visit www.fathomevents.com." PC: Since you and Marie are well-known for your variety show years, I would love to know what you think of this musical entertainment renaissance on TV that we are seeing of late. DO: Well, it’s really variety with different faces - same thing; different face. When you talk about AMERICAN IDOL, THE VOICE, DANCING WITH THE STARS, X FACTOR and all that stuff - it’s variety, but just slightly different from what it used to be. It’s the same old, same old. PC: You are a true triple-threat, whereas so many of the people that come to fame on those shows definitely are not. DO: Yeah, I think that the problem with variety now is that we have, you know, these 60-second performers. PC: What else do they have, right? DO: They’re one trick ponies. It’d be nice to see them onstage doing a whole 90-minute set. PC: That’s always the truest test of talent. DO: I was having a conversation with somebody the other day about this very thing - I remember when I was 14 and watched Elvis Presley live. PC: What was that like? DO: It was like watching The Entertainer, you know? He really held the audience in the palm of his hand. And, the problem that we have nowadays is that everybody has the bells and whistles to back them up and the dancers beside them and all the lights and the computers and everything, but, if you strip all that down, where’s the entertainer? PC: Pretty much only on Broadway, apparently. 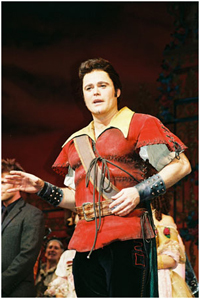 DO: That’s why I love the Broadway stage - you can’t hide behind any trickery, really. It’s you and that audience - that’s what I learned doing JOSEPH. PC: LITTLE JOHNNY JONES was your first big Broadway appearance, yes? It was a short run. PC: Do you remember seeing any shows growing up that had an influence on you? DO: Not really, I mean, I was so busy as a child - touring and Vegas and television - I didn ’t really have the opportunity to see too many shows because I was doing my own. PC: You grew up in the era of Andrew Lloyd Webber and Tim Rice’s JESUS CHRIST SUPERSTAR having a huge impact on your entire generation. What did you think of it then and what do you think of it now? DO: Well, I'll tell you I’ve learned to appreciate it more as I have grown older. And, I have learned to appreciate the genius of Andrew and Tim - which I especially learned when I jumped into the role of Joseph [in JOSEPH]. DO: You know, when you are learning a role like that, it’s about memorization and remembering your staging and the music and lyrics and everything, but, after a period of time, you kind of let your guard down and start engulfing yourself in the genius of the writing and in the music and the melodies. They certainly had it down! PC: You can say that again. 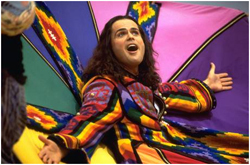 JESUS CHRIST SUPERSTAR and JOSEPH are companion pieces, in a way - both Biblically based, but SUPERSTAR is an adult rock-based show, whereas JOSEPH is a pop-based family show. DO: Well, if you think about it and put yourself back in their shoes at that time - they’re gonna swing the pendulum. And, that’s exactly what they did. PC: Have you heard the original version of JOSEPH that they recorded in the late 1960s with a male narrator? It was really an oratio and quite brief - maybe 40 minutes. DO: Yeah - not even that! They’ve just added songs and made it grow and grow and grow over the years. Actually, the mega mix at the end was kind of necessary in order for us to have a full-length show - it’s everything you’ve seen and heard, but with a sort of disco tone and flair. PC: When Tim Rice did this column, we spoke a lot about the new song he and Andrew wrote for the recent West End production - a new Elvis homage for the Pharoah. DO: Oh, that’s so great! I’m glad to hear that. I have not heard the song yet, though. 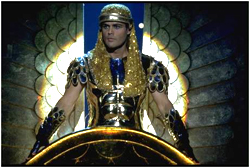 PC: Would you consider taking on the role of the Pharoah someday? DO: Who knows! You know, you can plan and prepare and all of this kind of stuff, but the future holds those kinds of secrets pretty tightly to its chest. You just don’t know what’s going to happen - especially these days when things turn on a dime. PC: It’s a whole new world. PC: Speaking of Vegas: what was it like working with a great director like Richard Jay-Alexander on your Vegas show with Marie? DO: Oh, Richard is just absolutely amazing - as you know. He’s the best. The best. PC: What’s next for the Vegas show? DO: I’m on lockdown at the Flamingo! They want us to sign until ‘14 and we are looking at it, but there are a lot of other things I would love to do. We are going on our fourth year at the Flamingo and they would like at least two more years at least - they said that they would like ten years if we would give it to them. 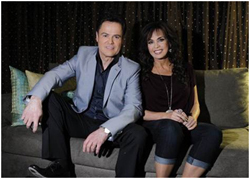 PC: Do you feel Richard Jay has designed the ultimate Donny & Marie show? DO: Yes, I think so. I really do. PC: Have you been putting changes in the show as the run goes on? DO: Oh, yeah - it always evolves. There’s always changes, otherwise everything gets stagnant. PC: What’s the most recent element you added to the show? DO: The Broadway Medley. We recap a lot of the stuff Marie and I have been in. DO: Right. But, we end with WICKED - not that Marie and I were involved in WICKED, but we just thought, “We want to end this way.” So, we sing “For Good”. PC: A great song - and a perfect selection for you two to do. DO: The lyrics are just so pertinent to our lives as siblings, so that’s just the perfect ending to the show that Richard carefully designed so beautifully for us. PC: He is also directing Kristin Chenoweth’s new tour, so maybe there will be a duet in the future with you and Kristin? PC: Have you ever met or worked with Richard Jay's frequent collaborator Barbra Streisand? DO: Yeah, I’ve met Barbra many times over the years, but I don’t know her that well. She is just the consummate professional - everything you’d expect her to be. I loved when two or three years ago she sang on the Grammys. Do you know the story behind that? PC: No. Why don’t you tell me. PC: She always delivers - no matter what. DO: It’s on YouTube - watch her expressions. At the end, she’s like, “I can’t believe I got through this!” And, she pushed through - she certainly did. PC: Having done JOSEPH for six years, were there times you performed sick for weeks and managed to make every show - like many of the most stalwart performers on Broadway somehow manage to do in long runs? DO: Oh, yeah! For instance, the final run in the beginning of 1998 - it was the final farewell performances - and, I got the flu. I missed like five or six shows because it was so bad - there were complaints like you couldn’t believe! PC: I’d imagine - you have a lot of fans. DO: When you are sick, you are sick - you know? PC: There is no way around it. PC: Really? You completely passed out? PC: In JOSEPH you were also not given a very warm or protective costume, either. DO: Yeah, I was pretty much in nothing from the get-go to the end. [Laughs.] Seriously, though, it did make me more susceptible - and, not only because of that, Pat, but we had the children’s choir in the show, too. PC: The germ factory in full effect. DO: Yeah, I was just popping vitamins like they were going out of style during that. PC: You have great rapport with the children’s chorus on Andrew Lloyd Webber’s 50th Birthday Celebration. Was the one balloon that flies up before “Close Every Door” rehearsed? DO: Nope! It was all live, baby! PC: You nailed your entrance right after it anyway. Did you ever have any difficulty singing that song, particularly that tricky top note at the end? DO: Well, obviously, over the course of six years you are going to have some challenges. DO: What I did with “Close Every Door” is that, at the end, I went higher than what he wrote it to be. PC: Did Lord Andrew like that? PC: “What have I gotten myself into”, right? DO: Yeah, really! I painted myself into a corner. But, yeah, when I started feeling a little under the weather, I would just take out the high note and sing it the way he wrote it. PC: What was your favorite part of JOSEPH to perform every night? DO: I think that my favorite part was when I was in disguise and chastising the brothers - I love just screaming and yelling onstage. And, also, I really liked being behind the bars singing “Close Every Door” - that was really the climax of Joseph’s role, in my opinion. PC: The role of Joseph is similar to JESUS CHRIST SUPERSTAR in that you get a catchy pop song, a big ballad and a big finish, yet he is a bit of a vessel as a character - you have to fill in a lot of the blanks as an actor, don't you? DO: Well, you know, it’s all tongue-in-cheek, Pat - the whole show is really tongue-in-cheek, but that’s really what made it resonate with everybody, I think. DO: There are moments where everybody can laugh at the characters - particularly the Elvis character and even some lines Joseph says; the lines are so cleverly written - but, then, there are moments where it gets serious and just when it is about to take itself too seriously, they lighten it up a little bit and it comes back around. It hovers around that, in between those too-serious and too-silly points. I think that’s what so great about JOSEPH - children and adults alike can enjoy the show together. PC: And the Fathom in-cinema presentation of JOSEPH is a great way to allow an opportunity for the whole family to experience it all together. 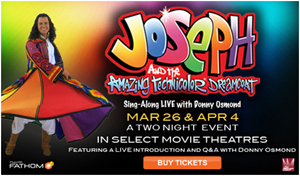 PC: What were the audiences you saw for JOSEPH as you performed in it and toured it for the better part of a decade? The theatre itself has gotten much more family-friendly since the 1990s. DO: Yeah - it has. I mean, there were always children at the show, but, every Wednesday, we would have schools come in - they would have a Q&A with the cast members. So, every Wednesday, it was wall-to-wall kids. But, throughout the rest of the week, it was mainly adults. It was so mixed, though, you really had everybody out there in the audience. PC: The score appeals to any age group, as well - the operetta potpourri format allows for so much variation in the score. DO: Yeah - the score has everything, too. PC: Maria Friedman is a fabulous Narrator in the film. Was your experience working with her an enjoyable one? DO: Yeah - she brought a whole different element to the narrator role that I never experienced throughout the six years of all the other Narrators. Janet Metz was more of an angelic kind of Narrator. Connie was a fun-loving kind of Narrator. Maria Friedman - she came from such a rich theatre background that, to me, she was the most theatrical Narrator. I’ve worked with seven or eight different Narrators and each one was fantastic, but I loved what Maria Friedman brought to it in the movie. PC: Joan Collins appears in the JOSEPH film in a cameo role, as well. She is known as being a bit of a diva, isn’t she? DO: [Laughs.] That’s definitely the word, baby! [Pause.] That’s all I’m gonna say. PC: Who were some of your favorite co-stars you have shared the stage with over the years? DO: They were all amazing, really. We did the recording with Janet Metz as the Narrator and she was incredible, and so was Connie Kunkle, who I did the show with, as well. PC: Is it true the recording you first did for JOSEPH onstage was done while you were still in rehearsals? DO: Yes, I was so engulfed in rehearsals I didn’t even get involved with any of the production of it. It was when we were up in Toronto. PC: Before you had even finalized your take on the role - a work in progress. DO: Oh, yeah - oh, yeah. Totally. PC: The film version and the subsequent soundtrack is a more pleasing sonic experience, I think. DO: Oh, yeah - definitely. After five years of doing the role, we got it down. PC: Tell me about your preparation for the film. Weren’t you and Marie doing your talk show at the time? DO: It was a little crazy. I had to fly over to Pinewood Studios in London - I had always wanted to go there because I am such a James Bond freak and that is where they did all the Bond films. DO: Between takes, I would be sneaking around and checking out all the old artifacts from Bond. It was such a great, great time over there - I flew my whole family over. I think we were there for three weeks or four weeks. We rented a house out in the country and I rented this little car - a mini-cooper - and I remember driving around. It was just so much fun to be able to sneak around those studios - so much history at Pinewood Studios. PC: OLIVER! to JOSEPH to SWEENEY TODD and beyond. DO: Oh, I didn’t know OLIVER! was filmed there. I remember I would always sing along as I watched Oliver, the actor who played him. PC: He was good, but Oliver Reed was such a genius - especially in that film. PC: What were some of your other favorite movie musicals growing up? PC: You did? What was that like? DO:: Well, it was scary! I was 9 years old when Gene called me in to do a little tap dance, but I can’t remember the part and I can’t remember the movie it was supposed to be for. But, he asked me to do “Shuffle Off To Buffalo” and he gave me a couple of lessons in tap dancing. So, I can say that Gene Kelly taught me how to tap. DO: I was able to work with Donald O’Conner, too - and, I know Debbie [Reynolds] very well, as well. PC: How apropos! Is it true that one of your sons is in the film of JOSEPH? DO: Yes. That’s my son Christopher, who is 21 now. My niece, Sophia, is in the children’s chorus, too. PC: Will you be bringing your whole family to see this in movie theaters next week? DO: Oh, absolutely - absolutely. We are looking forward to it. These sing-a-longs have been a big, big thing over in England, as you probably know. PC: Indeed - SOUND OF MUSIC, especially. DO: I think it’s going to catch on here in the United States. And, so many people know the music of this show - because they actually did it either in grade school or high school or they saw it or they have seen the video. There are a lot of people that have been a part of it somehow and they know the musical, so I think it’s going to work. PC: It will be a bit tongue-tripping to try to keep up with all the colors in the sing-a-long, though! DO: [Laughs.] To this day, I still don’t know all the colors. PC: Do you remember the order anymore? PC: I guess that counts! One of your co-stars in the film of JOSEPH is director and actor Richard Attenborough. Do you have any memories of sharing time with him onset? DO: That man had so many wonderful stories! We would sit in director’s chairs, in between takes, and he would just talk to me. Richard was very close to Robert Downey, Jr. during his terrible years and he would tell me how he would spend a lot of time with Robert and help get him through a lot of the messes that he was in. And, I remember a lot of experiences of him telling me stories and I wish I could recall all the details, but I can’t because there were just so many. PC: What a great memory of him. DO: There was something about him that was very calming. You know, I had done the role for six years up until that point in time, but, doing a movie and stuff like that was kind of different for me - it’s really not what I do; I mostly do stage work. PC: It was a bit outside your box. DO: Yeah, and, even though we had a great director, it was Richard that was really the one who kept the calmness on the set, which was really cool. PC: He was a noted director in his own right, of course - GANDHI being the big example. DO: Right. Right. You know, there are directors and, then, there are actor’s directors. DO: Yeah - you know, he’s been there; he’s done that. He knows how to talk to the actor and get them through the scene and make it the best possible. PC: What was it like for you to relearn the role of Joseph for film? Was it a big leap from stage to screen in your experience? DO: It was. It was very different. To do it on film, with no audience - I mean, there was interaction and we really broke that fourth wall a lot when we did it live - was slightly different than what I did for six years. It was a different experience. PC: How did you get into shape for the role? DO: I said, “That is just a piece of it, right?” And, they said, “No. That’s the costume. This is the entire thing you will be wearing.” And, I said, “You’ve got to be kidding me! I’m going to the gym right now!” So, I was basically there four or five times a week, you know, pumping iron with a trainer. PC: It is a whole lifestyle change in a lot of ways. DO: Exactly. I was watching what I was eating, too, but since I was burning so many calories, I didn’t have to worry so much. PC: It’s required of the role to a certain extent for Joseph in JOSEPH and Jesus in SUPERSTAR, especially given the ending. DO: Oh, yeah - you’ve really gotta be perfect for that one! PC: This JOSEPH film presentation has some special components, as well - in addition to a new animated opening sequence, there will also be a portion of the show you will be involved with, correct? DO: Yes. I will be doing a live Q&A during the event where you can text in your questions. PC: It will be a phenomenal event. With this playing in New York, along with THE PHANTOM OF THE OPERA and the two new revivals of his collaborations with Tim Rice - EVITA and JESUS CHRIST SUPERSTAR - there will be four Andrew Lloyd Webber shows available simultaneously to see next week. DO: That’s so, so cool. I can’t wait to see those revivals. I’ll be seeing those - you better believe it. PC: Have you seen Andrew Lloyd Webber’s new show, LOVE NEVER DIES? It just had a very successful Fathom movie theater showing recently. DO: No, I haven’t heard or seen it yet, but we actually talked about it during the run of JOSEPH in the late-90s. We talked about how that would be a perfect thing to do to follow up JOSEPH with. DO: Yeah, but, I got busy with the talk show and touring so it ended up not happening. PC: You actually recorded the melody that ultimately became the title song of LOVE NEVER DIES when it was titled “Our Kind Of Love” when you sang it on your Broadway album. PC: Is that why you recorded it? Was it still intended for the PHANTOM sequel at that point as far as you knew, in the mid-2000s? PC: How intriguing. Do you enjoy your relationship with Lord Andrew? DO: Oh, yeah. As a matter of fact, I remember one time when Andrew asked me to perform at a Jubilee performance for the Queen. He had assembled this group of great singers all together and he called me up and he said to me, “Donny, I want you to sing a song from WHISTLE DOWN THE WIND.” And, I said, “Absolutely. No problem.” So, I flew over to London and we were rehearsing. So, you have to imagine: I am onstage, rehearsing with a full orchestra, and it is just like the movies - where nobody is in the audience except for one person; and, in this case, it was Andrew. PC: The composer himself! A bit nerve-wracking. PC: Was it “When Children Rule The World”? DO: Maybe it was - I can’t quite remember now. PC: What happened after the performance? DO: It was so funny because, after the show, he looks at me and I look at him and we both started laughing. So, then, he took me to his house - he was having a party by his home - and, he said, “Come here over to the piano!” And, then, we sang the song - correctly - at the party. Then, he starts playing “Puppy Love”! DO: Here I am, singing “Puppy Love” and Andrew Lloyd Webber is serenading me. It’s one of the coolest moments ever. PC: What a great story! Speaking of WHISTLE DOWN THE WIND, one of my favorite concept albums is that one. What was your experience working in the studio with Andrew and Jim Steinman on that? DO: Well, what I basically remember is that they handed me the music and they said, “Interpret it for us.” So, I rehearsed it and really, really worked on it and they just loved it. PC: That concept album is so filmatic and has so much variety - Elaine Paige to Meat Leaf to Boy George to Tom Jones. DO: It’s a really, really cool album. PC: I think WHISTLE DOWN THE WIND is probably Lord Andrew’s most underrated score. It’s the lost Andrew Lloyd Webber show. DO: I totally believe that, too. I saw it in London and I absolutely loved it! Then, it just kind of disappeared. PC: It has a great message of hope and believing which we need now, it seems. We can use some hope, I think. DO: Boy, ain’t that the truth! PC: Do you think there is a restorative power to theatre - can it alleviate depression and bring joy in a manner few things can? DO: I am not going to just say yes, I am going to give you a story that solidifies the answer. DO: When I was rehearsing JOSEPH - we had six weeks to rehearse - the great Steven Pimlott, who was directing it - a great Shakespearean director - as he was molding me into this role, he took me into a room and we were talking about the role and pulling it apart and deciding his thought patterns and things like that; you know, you have to get down to the raw, real, visceral elements of a character in order to really embrace it. PC: And make it come alive. DO: I can’t give you a more serious answer than that and to say, “Yes!” The theatre is a place where people come to escape. It’s a place where people come to engross themselves in the parts and the music and in the scenery and in the story - the whole thing. It’s such an important thing. [Laughs.] Live theatre will never disappear. PC: What he said to you is so apropos given the themes of JOSEPH and his dreams, as well - “Any Dream Will Do”, right? DO: Any Dream Will do. PC: So, looking ahead: should we expect an appearance from you on the first episode of Marie’s new talk show? PC: We’ll see what happens, right? DO: I’m kidding - I’m kidding. I’ll be there! PC: Did you two consider doing the show together - you enjoy the daily talk show experience, I’ve heard. DO: I do. I do. But, right now, the plate’s just a little full. I just can’t add anything else to the schedule right now. PC: Would you be interested in judging a reality competition in some capacity someday? Andrew Lloyd Webber is doing a new JESUS CHRIST SUPERSTAR casting show now, you know. DO: Oh, yeah. I’d be interested, but the opportunity hasn’t presented itself yet. I’d love to do one for Andrew, though. PC: What about an appearance on GLEE someday, especially having been the teen idol you were? Would you be open to that? DO: They haven’t contacted me yet, but, to be honest with you, I would definitely consider it. It hasn’t presented itself just yet, though. PC: A live action BEAUTY & THE BEAST is being bandied about. Would you consider doing something more with that show in the future in some capacity? DO: Oh, I’d love to be a part of that! I love that role. I did that show for five or six months back in ‘07 and I loved it. It was so much fun to play the villain. PC: Which is a bit against type for you! That score is so impressive - Alan Menken, Howard Ashman and Tim Rice. DO: Right. Alan Menken? What a genius. PC: Speaking of Disney: what about MULAN memories? DO: Yeah - a lot of people don’t know I was the singing voice for one of the characters in that. PC: Lea Salonga spoke so favorably of that experience and working with you on that when she did this column. DO: Really? Oh, that’s so cool. I love Lea. PC: That film has a big following with female fans of a certain age, I’ve personally found. DO: Yeah, I think it is one of those that will always be kind of under the radar, but everyone who has seen it loves it. PC: You were playing against type in that film, as well - not the nice boy next door, for sure. DO: Yeah! Yeah. You know, you gotta get into character! PC: JOSEPH will now be the third Andrew Lloyd Webber Fathom presentation in six months - PHANTOM 25, LOVE NEVER DIES and now this. And, just as those were, it’s unmissable! DO: That’s really, really cool and I am just so excited that this new form of entertainment even exists. PC: It’s so fabulous a whole new generation will be able to see JOSEPH in this thrilling new way. This was magnificent, Donny. Thank you so much. DO: This was really fantastic, Pat. Thanks a lot. Bye. Pat Cerasaro is a playwright and screenwriter currently in pre-production on his first feature film.